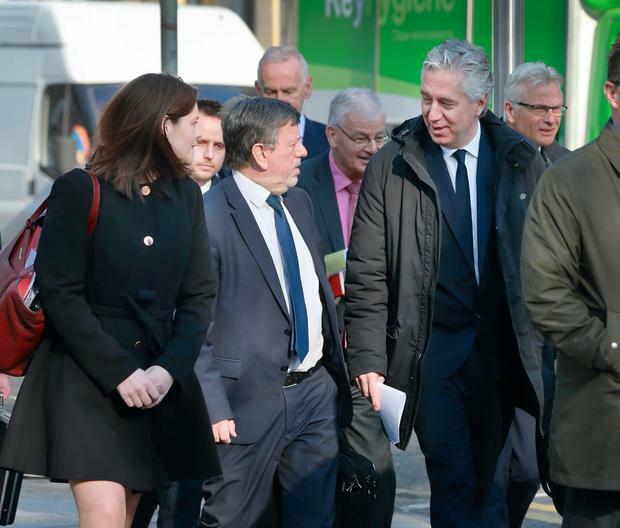 THE Football Association of Ireland (FAI) did not advertise to fill John Delaney’s new role as executive vice president as they felt they had “somebody who had the skillset that matched the role”. FAI president Donal Conway made the remarks as FAI representatives are today being grilled by the Oireachtas Sport Committee. The Association’s officials came under pressure from Sinn Féin TD Imelda Munster to explain the decision to appoint former chief executive Mr Delaney to the new role. Ms Munster said the FAI created the role, questioned if it was advertised and asked if it was good governance if it wasn’t. She said: “Do you accept it appears to people that it’s the same old, same old at the FAI board,” and she put it to Mr Conway that the FAI is “reflected in a very, very bad light”. Mr Conway said: “As chairman of the board the image of the FAI of course is important and harming that image is a matter of serious concern to us. He said the appointment as dictated by a series of projects including the potential hosting of major international competitions. He said that other than Mr Delaney there’s no other member of the FAI who would be a member of the executive committee of Uefa or who would have a presence at Fifa. “I think you could challenge us on an issue of good governance if there were a range of people… who would have fitted the role of executive vice-president with the responsibilities attached. “But it was the board’s view that there was one person who would suitably be able to manage those projects. He said a presence at Uefa, contacts within Uefa and Fifa was “all going to be of benefit to trying to manage the series of projects that we assigned”. Ms Munster said if it had been advertised the FAI may have been able to find someone else. Mr Conway said he knows who the members of Uefa and Fifa are and “I’d like to think we had much more Irish people eligible out there”. Solidarity TD Ruth Coppinger asked Mr Delaney about his new role. Earlier he said he would not answer questions on a €100,000 loan he gave to the FAI or his former job as chief executive on legal advice but he was willing to engage on his role as executive vice president. Ms Coppinger put it to him that he said in an interview that the new role would be more focused as he was effectively doing three jobs. She asked him if it would be fair to say he was still “double-jobbing” as executive vice president and as a member of the Uefa committee. Mr Delaney rejected this saying: “No,” adding that Mr Conway was “quite right that a number of months ago we would have discussed the constraints and the amount of time I’ve had to spend doing effectively three roles”. He said these roles included firstly attending functions and visiting clubs every weekend, secondly, managing a business with a turnover of almost €50m and, thirdly, being on board of Uefa and managing specific projects. Ms Coppinger asked Mr Delaney if it would be fair or accurate to say that the salary for that is more than the total League of Ireland prize money? Committee chairman Fergus O’Dowd said Mr Delaney didn’t have to answer that question unless he wishes to. He said the role of the committee was to stick within its remit. Amid the discussion on Ms Coppinger’s question her time ran out and the she did not get an answer from Mr Delaney.